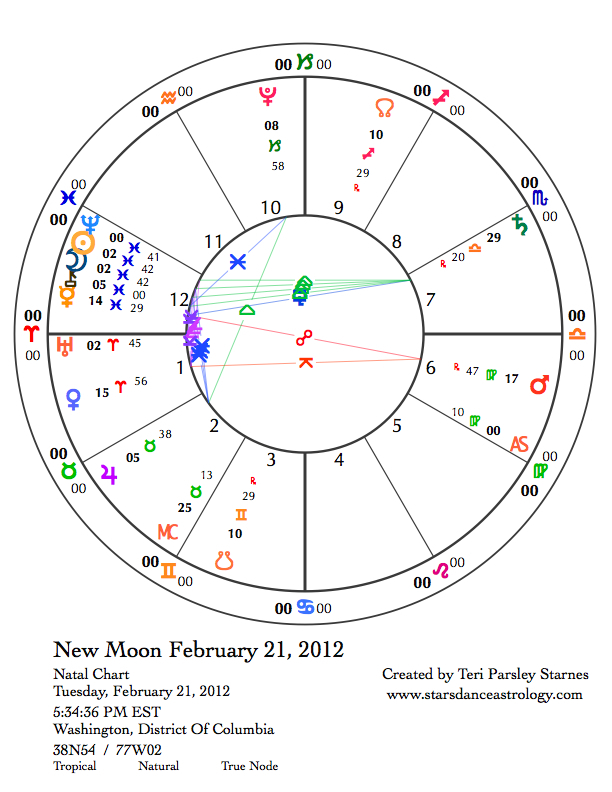 The chart for the New Moon in Pisces looks like a welcome committee for Neptune’s recent ingress into this fishy sign. No one can party like a Pisces, after all. The cry, “Everyone into the pool,” takes on special significance at this party. Pisces is the urge to merge, the need to melt away differentiation, the impulse to lose oneself in the mystical stew of being. Sounds like a good party, right? The season of Pisces is more than just a good time, however. Possibilities abound as we enter the liminal time of Pisces. In astrology’s system, the year begins at the Vernal Equinox. Astrology’s year ends in Pisces with everyone swimming, merging, and losing the hard edges acquired over the previous year of life. We melt down, losing form, before we begin a new year of growth and manifestation. 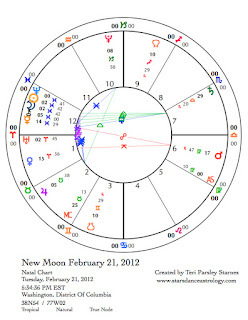 Because Neptune has now joined the Pisces party, this time is especially potent. The last time Neptune traveled through Pisces, which it rules, was from 1847 to 1861. We can go back and look at that era to forecast the themes of the next 14 years. Dreams and passions marked that time. Here is the heartbreak of Pisces: Not every dream is possible and not every state of ecstasy is true. Illusion and disappointment are also invited to this party. The intention I hold for this state of being, is to acknowledge my disappointments while refusing to become bitter or cynical, to let my dreams lead me into wonders of possibility, and to have compassion for our common experiences of both wonder and grief. A pair of planets graces the skies now; they add to the wonder of this season. Venus and Jupiter can be seen coming closer and closer together over the course of this lunar month. Look for them high in the western sky at sunset. 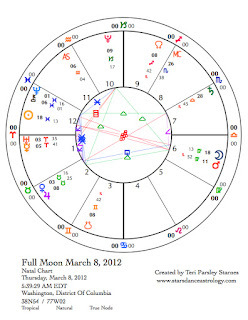 The exact conjunction happens on March 13 at 9° Taurus. This is an especially inspiring time because Venus and Jupiter—the two benefics—will be part of a Grand Earth Trine with Mars in Virgo and Pluto in Capricorn. It seems like a lot of forecasting for this next year is traumatic, however, this aspect configuration promises something different if we consciously engage with this energy. The potential is for all the power, strength, and beauty of earth to be available as an ally for manifestation. Look to the sky this month for inspiration when you see Venus and Jupiter shining down. An important stage of Mars’ retrograde through Virgo happens this month—when Mars opposes the Sun on March 3 at 13° of Virgo. If the myth of Mars right now is about the Hero’s Journey, then when Mars connects to the Sun, we reach enlightenment in that journey. Something is attained, but the long road of return is still ahead. A fertile area to explore is the relationship of Virgo’s practicality, humility, and service, to Pisces’ idealism, sacrifice, and compassion. Where is the balance for you? The Full Moon, occurring just a few days after this opposition is another time to realize how these two signs are connected and necessary for each other. 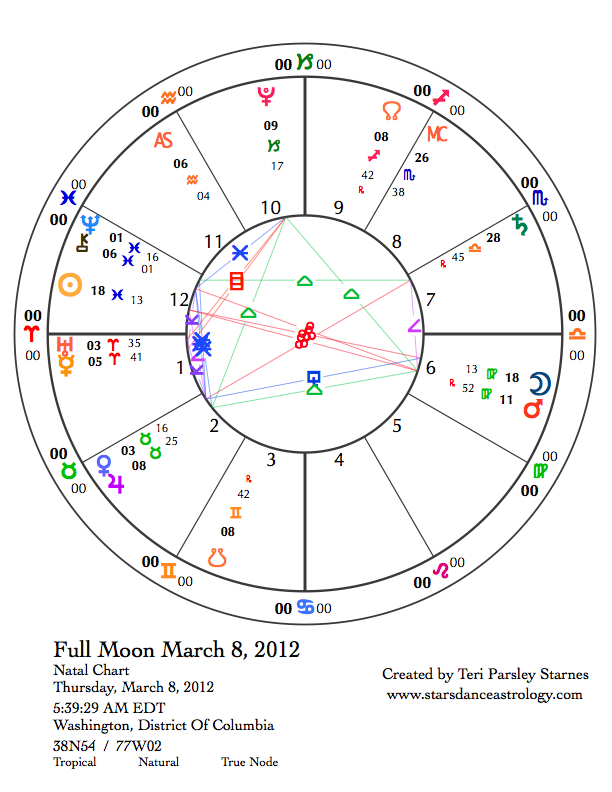 The Full Moon chart also highlights another theme for this lunar month. Mercury is stationing retrograde again! And this time he begins with a conjunction with revolutionary Uranus. Due to retrograde motion, Mercury will join with Uranus three times: March 5 at 3° Aries, March 18 at 4° Aries, and April 22 at 6° Aries. Mental energy will be strong and the trickster quality of both of these planets will be especially strong. I am reminding myself to back up my computer files. In preparation, I recommend praising Mercury as a great god, for he is the one who reminds us that reality begins in our minds. What we cultivate mindfully will show up in our lives. The new year begins on March 19 when the Sun enters Aries, a sign of action and leadership. Before taking the reigns of your year, use this Piscean time to wonder, dream, and dissolve. Time spent in this water will nourish us for the adventure ahead.